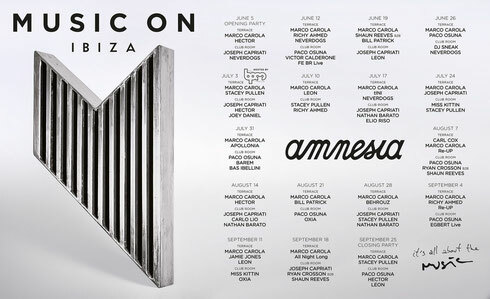 After many months of big nights in Miami, New York, London and Paris, the Music On family is ready to return to its summer home, the world famous Amnesia Ibiza, on Friday 5 June 2015. In its fourth season Music On stays true to its love affair with music, and joining commander-in-chief Marco Carola will be Paco Osuna, Joseph Capriati, Leon, Hector, Nathan Barato, Stacey Pullen, Bill Patrick, Re-Up, Ryan Crosson and Shaun Reeves. Carl Cox will appear as a special guest for the third edition in a row. In addition, Jamie Jones, Apollonia, Matthias Tanzmann and Richy Ahmed are also welcomed to the family. The 2015 Music On Ibiza season is made up of 17 energy-fuelled nights of musical encounters; another big season surely lies ahead, inspired by one fundamental reason - the music.